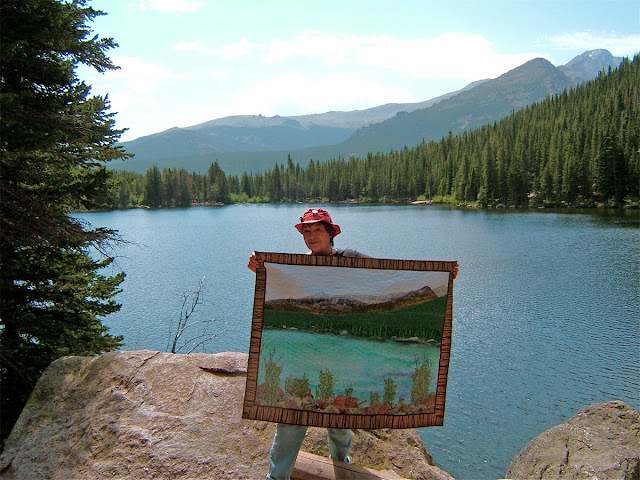 We took the finished quilt to the spot on Bear Lake where I had taken the photo that was my reference for making it. It is now hanging in the living room of our friends who live in Estes Park. 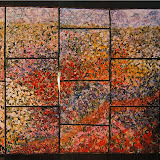 From the moment I began creating this piece I knew it belonged in Colorado so it wasn't difficult to part with. I'm pleased to leave a bit of myself in a place that is dear to my heart. The fabric I chose for the backing is full of bears. One of the reasons is to represent my close encounters with black bears in our cabin. Go here and here to read about those. The other is that the name of this depicted lake in the Rocky Mountain National Park is Bear Lake. So, of course, whatever else in the world would I choose. The front of the piece is machine sewn and quilted. That was finished before I left the cottage in Michigan. All the handwork is done in the construction details on the back side. I've been working for days in one of my favorite spots ... along the Big Thompson river, the stream that runs past our cabin here in Colorado. A facing (double width and folded) was machine sewn to the edge of the quilt before the yarns were to couched to finish that outside edge. The fold is hand-stitched in place. This facing helps to stabilize that edge since there is no binding which functions to do that to most quilts. A tube of fabric covers the machine zig-zag stitches that connect the border to the quilt and the decorative yarns that hide the seam on the front. It is hand sewn into place leaving space for a narrow piece of wood doweling to be inserted. This will help the sides to hang straight with no flipping up of the corners. 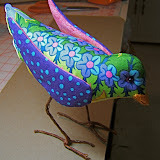 A little trick that would not be allowed in a quilt show ... at least, not in the SMQ show. A double thickness fabric sleeve is made in two parts ... the method I use for all larger quilts so it can hang from the center as well as from the ends. Here you see the flat piece of wood with a drilled hole that the nail it will hang from will fit through. There are also holes drilled in each end so it will hang from three points. Soon it will be finished and hanging in its new home. Thought I'd share some photos taken from Trail Ridge Road, the highway that crosses over the top of some of the Rockies highest peaks. It's the longest continuous highway in the United States that's over 12,ooo feet high. The road is narrow with hardly any shoulders and has steep drop offs. There's more snow than we've ever seen at this time of year. A lot more fell in the high country than than the valleys last winter. Great for the skiers and good for the winter golfers. I find it difficult to believe that the courses are open all winter here in Estes Park. There are resident herds of elk down in the valleys and even in town. However, most of them go up to the high country for the summer. Back to the mountain lake piece. The edges of the rocks had been left loose so the shrubby trees and flowers could be tucked between and behind them. 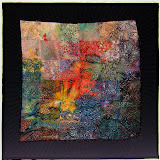 The raw edges of the rocks are free-motion quilted into place with a brightly colored variegated King Tut thread. I drew more stems and trunks with oil stick pastels, water color pencils, and felt tip pens ... in other words, I used whatever worked to get the effect I desired. Here's a photo of the huge boulders along that lakes shoreline. 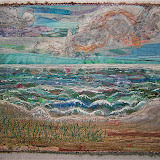 The quilt's shoreline is greatly influenced by the one along the stream that flows past our cabin. The borders are done in my "ortwork" collage technique. 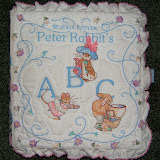 Lengths of various yarns were laid across a base fabric that has words pertaining to forests printed on it. 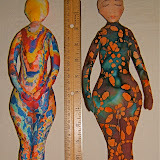 I had made two long extra wide pieces ... one for the sides, the other for the top and bottom. 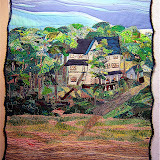 A layer of black tulle was laid over the top and then I machine quilted and couched other yarns through all the layers. The borders were cut to size and the corners mitered. 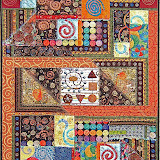 They were zig-zag stitched to the main part of the quilt. Various yarns are couched over the outside and inside edges over the border. Now the not-so-fun part of hand-sewing facings and a sleeve to the back begins. and this just outside out door. Getting here takes a lot of effort. The cleaning and clearing out of our Lake Michigan cottage is a huge amount of work. Then there's the stress of traveling which included lots of road work on our drive around Chicago and a delayed flight out of Milwaukee. But we made it and now my vacation begins. Determining a quilt pattern for the lake was the most difficult for me. I didn't wish to lose the wind wave patterns created by the crayon rubbing, but I could see no way to accent them. So, I just did ripple patterns. 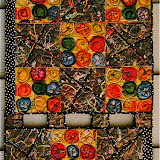 Now that it's finished, I see that the quilting does not obscure those crayoned patterns. 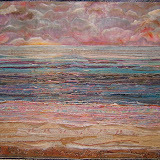 I began at the far shoreline with a small scale free-motion ripple pattern using a dark variegated blue King Tut thread. The water's edge is shaded with watercolor pencils (my first experience with them). Then I switched to a medium value variegated blue K.T. thread and free-motion quilted a larger scale of the same ripple pattern in the foreground. The middle of the lake reflects the light sky and is stitched with a light value variegated blue K.T. thread with a medium sized ripple pattern. I don't know how excess top fabric got in the middle of this lake, but it did. Thankfully, it ended up there where wind waves do occur rather than on either bank. Although if I had worked sequentially across the lake from the far bank, I could've tucked the wrinkles behind the rocks. The lake is a bit more "sculptural" than I had intended. The scrubby trees and flowering weeds came next. The back sides of the individual pieces were sprayed with a temporary fabric adhesive to hold them in place between and behind rocks. I cut over-sized pieces of aqua tulle netting for each "grouping" and pinned it in place to do the quilting. Free-motion stitching along the stems and branches was done with a beige variegated K.T. I used a variegated K.T. green for the leafy areas. The excess tulle outside the quilted areas was trimmed away. I wish to thank Anne for suggesting the tulle layer so that a minimum of quilting would suffice. It's amazing how difficult it is to see the tulle layer. The aqua color blends into the color of the lake between the foliage. 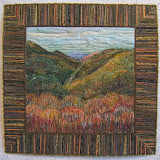 Machine free-motion quilting of the mountains and sky was done much more quickly than that of the trees.